Over the years, United Church has proudly supported a choir program ministry that encompasses all ages. Our Celebration Choir is the choir that sings at the Sunday worship services. We rehearse most Thursdays from 7:30 - 9:00 pm. We also sing at special services throughout the year and during the Holy Week services before Easter. New singers are welcome to join us at any time during the year. Coro de Paz is a community children's choir for grades 2-5 (ages 7-12) - they are new in the fall of 2017. Summer of 2014, the church council approved establishing a Music Together® Center at United Church. We pursued licensing and training and are happy to say that we opened with three lively classes on October 23. Music Together® is a program of classes for children ages 0-7 and is offered as family classes (mixed ages, and the adult attends, too) as well as in school and therapy settings. For more information on our center, visit the Music Together at United Church website. For more information on Music Together International, visit their website. Our beautiful 2-manual 9-rank pipe organ was originally built and installed in the “new” sanctuary of the Cloverdale Congregational Church in 1907. Built by Berkeley organ builder Thomas Whalley, it is perhaps one of only a few instruments by this organ builder that still exists. 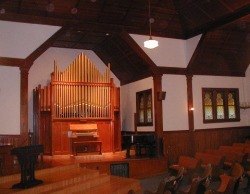 According to records of the Organ Historical Society, Whalley built and installed approximately two-dozen pipe organs throughout the West Coast in the late 19th and early 20th Century. Included among these is an organ that was installed in Grace Cathedral in San Francisco, as well as an organ for the Church of the Incarnation in Santa Rosa (neither instrument exists today). Our organ may be one of only two that remain in the building in which they originally were installed— the other organ being at First Congregational Church of Alameda, CA. In the 1980's and 1990's, the instrument became unstable, through normal wear and environmental factors, to the extent that it was unpredictable and sometimes unplayable. Rebuilding was made possible by a major grant from an anonymous private foundation in Southern California. In mid-December 2002, United Church signed a contract with organ builders Hupalo & Repasky (with work generally directed by William Visscher). Included in the rebuilding contract was the complete restoration of the original instrument and its reinstallation, plus the replacement of one existing rank of pipes (an almost inaudible Aeoline) with a new rank of “oboe” pipes to permit the instrument to be more versatile and better able to lead congregational singing. About the same time, a beautiful 1903 Steinway Model 'O' piano became available. Its long-time owner (recently deceased) was connected to a friend of the church, and her heirs wanted to sell the instrument. The cost for the piano, along with the rebuilding costs beyond the amount of the grant were funded through recent donations to the organ/piano fund by church members and friends, and by donations from members of the Cloverdale Arts Alliance. Do you have thoughts and ideas concerning our Music Ministry? Share them! Contact Janice by emailing her, or use the form on this page. Interested in singing in a choir or ringing handbells? Have a great idea or a hymn request? Send us a note, or call the Church Office at 894-2039.